About this Travelers 7 Day Plastic Pill Case:Great for travelers.Holds a weeks worth of pills.Material: Polypropylene - Recycle Code #5 - BPA-FreeSpecial Instructions:Rush Service:Rush Service prices are for one color imprint only, standard ink colors. Multicolor imprints, halftones, additional location imprints and PMS matches will require an additional 1-3 working days. About this Translucent Plastic 4 X 7 Medicine Tray Organizer:A medical organizer for an entire week; Plastic base holds seven, removable, four-compartment pill boxes with easy-out design; The plastic base is equipped with convenient, easy-to-use holes for facilitating pill box removal.Pill compartment is ½"x¾"x½".Material: Polypropylene. About this 7- Day Pill Case:The 7-Day Pill Case is a storage box that features seven compartments and a conveniently labeled day of the week on the hinged, snap-up lid.Material: Plastic. 7 Different Compartments Great for Health Industry Snap Lid Screen Printed 7 Diderent Compartments This pill case features seven different compartments, making it great for organizing medication for the week. Great for Health Industry Pill cases are a favorite for health industry promotional and when promoting to the elderly. Snap Lid A snap-up lid closure on each of the pill case compartments help you keep the compartments securely closed. Screen Printed Pill case is customized with a screen print of your logo or design on the front in up to two colors. Special Instructions:1 Day Rush, available upon request for 1 color, 1 imprint location orders. About this Pill Box / Bandage Dispenser:8 Bandages.3 Separate Compartments.Bottom Slides Open To Access Bandages.Bandages Are Latex Free.Meets FDA Requirements.Special Instructions:Rush Service:Catalog Quantities Only.One Color And One Location. About this Stack 8- Compartment Folding Organizer:The Stack 8-Compartment Folding Organizer is a deluxe, triple-layer storage box with snap-lock closure. Flip outer hinge open to expose internal organizing compartments. Holds pills, vitamins or small personal accessories for discreet and secure travel.Material: Plastic.Special Instructions:1 Day Rush, available upon request for 1 color, 1 imprint location orders. About this Round Pill Holder:4 Separate Compartments.Meets FDA Requirements.Rotating Top With Large And Small Snap Lids.Special Instructions:Rush Service:Catalog Quantities Only.One Color And One Location. About this Pill Bottle (Small):Get creative with your message using this small pill bottle filled with your favorite items. Printed with a high gloss laminated four color process Decal with full bleed, magazine quality printing it makes a gorgeous presentation. Special Instructions:Blank items not available.Between the months of April-September we recommend Chocolate, Breath Strips and heat sensitive items be shipped in an insulated carton with cold packs. This adds $14 per carton. It will require 2-Day air shipment. Chocolate and nuts should be stored in a cool dry place. About this 3- In -1 Brush And Pill Case Kit:High Impact Plastic With Shatter-Resistant, High Quality Mirror.Twist Off Lid To Reveal Pill Case.Hair Brush.Meets FDA Requirements.Special Instructions:Rush Service:Catalog Quantities Only.One Color And One Location. About this Mini Pill Bottle:Get creative with your message using this Mini Pill Bottle which can be filled with a variety of mints, candy, and gum.Special Instructions:Blank items not available.Between the months of April-September we recommend Chocolate, Breath Strips and heat sensitive items be shipped in an insulated carton with cold packs. This adds $14 per carton. It will require 2-Day air shipment. Chocolate and nuts should be stored in a cool dry place. About this 7- Day Strip Pill Box:This plastic box features pill storage compartments with easy-open snap-up lids for each day of the week. Each compartment holds one or more pills and is labeled in Braille as well as standard letters. Great for hospitals and wellness clinics. Labeled in Braille as well as standard letters. Materials: PlasticSpecial Instructions:Rush Service:The standard imprint method, 1-color/ 1-location is available. About this Slider Pill Box:Dual chamber Pill Box. Easy to open slide feature. Materials: PP (Polypropylene) PlasticSpecial Instructions:Rush Service:The standard imprint method, 1-color/ 1-location is available. About this Pill Cutter and case:Rectangular translucent pill cutter with pill storage. Individually poly bagged. About this Heart Pill Box:Heart-shaped, lightweight, compact design. Holds a variety of pills, large or small.Special Instructions:Rush service: 1-color/1-position required. Item color assortments are not available. About this Jumbo 7- Day Strip Pill Box:People will love the convenience of the pill box, which is the perfect size for holding a variety of pills and vitamins. There is a separate compartment for each day of the week! Great for hospitals and wellness clinics. Labeled in Braille as well as standard letters. Materials: PlasticSpecial Instructions:Rush Service:The standard imprint method, 1-color/ 1-location is available. About this Plastic Bandage Dispenser with Pill Case:Translucent Plastic Bandage Dispenser w/ Pill Case. White imprint is recommended for translucent items. Individually Poly bagged. Does not include band-aids. About this Oval Pill Box:Oval-shaped, lightweight, compact design. Holds a variety of pills, large or small.Special Instructions:Rush service: 1-color/1-position required. Item color assortments are not available. About this Tri - Minder Pill Box:Contemporary design allows for convenient access to medication. Features 1 large compartment and 2 smaller compartments for keeping pills fresh and separated.Special Instructions:Rush service: 1-color/1-position required. Item color assortments are not available. About this 7- Day Pill Box:Compartments to hold pills for 7 days. Case molded with days of the week.Special Instructions:Rush : 1. Catalog quantities only.2. Valid only for the standard number of imprint colors/positions included for each item. About this Primary Care Pill Cutter:Safety blade allows safe, accurate splitting of most tablets or caplets. Two rounded internal compartments provide convenient storage and easier scooping of pills.Special Instructions:Rush service: 1-color/1-position required. Item color assortments are not available. About this 7 Day Pill Case:This expanded version of our popular daily pill case is certain to get your message across every day. Segmented enclosures hold each day's dosage of medication or vitamins. About this Jumbo 7- Day Med Minder:7 extra large capacity compartments handle multiple medications or vitamin regimens with ease. Large imprint area on front assures that the advertising message won't be missed.Special Instructions:Rush service: 1-color/1-position required. Item color assortments are not available. 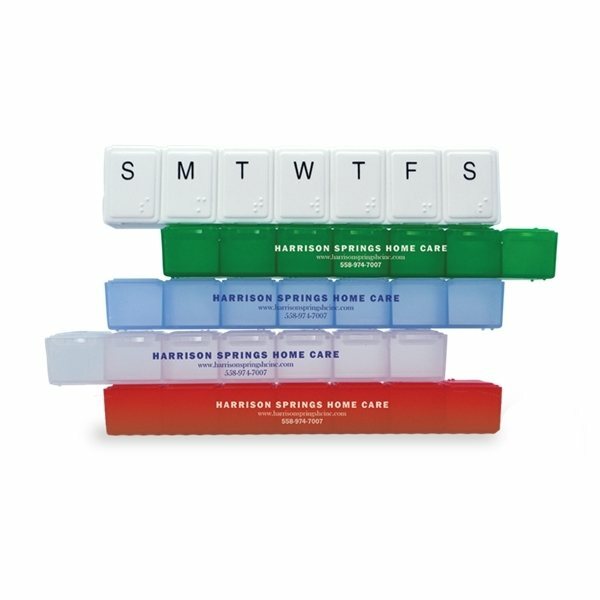 About this Quick Care 7- Day Med Minder:Easy-open lids for each day of the week.Each lid is labeled in Braille as well as standard letters.Convenient size fits into most purses, medicine cabinets and drawers.Made in the USA.Special Instructions:Rush service: 1-color/1-position required. Item color assortments are not available. About this 20 oz /600 ml Pill Organizer Bottle:Sleek "In Style" pill organizer & water bottle combined…the practical, modern way to keep your pills and water organized. Time to take medication! Avoid the unpleasant taste of swallowing pills without water. It gives you easy access to your water and medication. This smart water bottle is equipped with a built-in seven-compartment pill organizer, so you'll never be without water to wash down your daily medications—even when you're on the go. Removable pill compartment for easy access and dishwashing. CAPACITY: 20OZ/600ML. About this 7- Day Am / Pm Med Minder:14 rounded compartments provide easy access to pills. Angled imprint area makes advertising names stand out. Thank you Angela and Kelonda. This item is the #1 top seller in this category. It’s a great promotional item to promote wellness and safety. Pill boxes are great for organizing pills. With so many pills or vitamins, customers could lose track on what they’re supposed to take. Pill boxes help do the job! Keep your pills organized and safe with our 7 days pill case. With plenty of room for a variety of pills, this organizational box is perfect for keeping medications straight. Ideal for hospitals, doctors, home care services and more. Thank you Grace, Collin and Erica for your positive reviews on our promotional 8” Polypropylene Super 7 All Week Pill Box. Pill boxes are great for organizing pills. No matter the age, this product will do the job for pills and vitamins. Seven, snap-tight lids, each screened with the day of the week. Rugged, polypropylene construction for long-lasting health protection. Compartment size is 1⅛" x 1½" x ⅞". Order your 8” Polypropylene Super 7 All Week Pill Box here. Thank you Jermayne, Ricman and Sean for your reviews. The pill cutter is what makes this item a hit! Our promotional Compact Pill Cutter/Dispenser is a popular item because of its cutter. It makes it a convenient item to have. Plastic pill cutter with large interior main compartment and round medicine tablet-shaped design. Small metal slicer cuts pills safely and easily. Storage compartment holds approx. 10-12 pills. With different styles and colors of promotional pill boxes available in our selection, you’ll be able to find the perfect one for you! We have 7-day pill boxes, medicine tray organizers, pill holders, pill cutter/dispensers, pill cases, pill kits, and more! Promotional pill boxes are convenient for customers who take a lot of pills, but also customers who take vitamins. This makes a good product for all ages! Train kids at an early age with vitamins. You could use promotional pill boxes for many different reasons! Let your customers organize their pills and/or vitamins with a promotional pill box! Look through our selection of pill boxes. Shop here! Our durable medication care products are specially priced and professionally imprinted to promote your brand in the best light. Search our site for a great selection of boxes, bottles, and pill cutters! See for yourself just how high AnyPromo’s standards are when it comes to brand impact. Click through our inventory of promo pillbox items on sale now. Here is a snapshot of our selection of custom pill box products currently available. We’re ready to help expedite your order, so give us a call! Promotional pill boxes can be given to all ages, but are mainly given to the elderly customers. Give them a pillbox to organize all of their pills! Have any questions regarding our promotional pill boxes selection? Live chat with one of our customer service representatives to help answer all your questions! They are standing by ready to help you. Our featured list of pill boxes are currently trending in this category. Don’t miss out on these everyday products!